Dyssodia papposa (Vent. ) Hitchc. Stems: Erect or spreading, mostly single, bushy-branched, very leafy, glabrous or sparsely hairy. Leaves: Opposite or uppermost alternate, sessile or short-stalked, .5 to 2 inches long, .5 to 1.5 inches wide, deeply pinnately divided; segments narrowly linear, .5 to 2 inches long, sometimes divided again; margins toothed, dotted with brownish orange oil glands. Inflorescences: Clusters of heads, numerous, small, sessile or short-stalked, near ends of branches; involucres cup-shaped; bracts in 2 series; outer bracts 4-9, short, green; principal inner bracts 6-12, brownish to purplish, with prominent orange oil glands. Flowers: Ray florets 8 or fewer, inconspicuous, yellow to orange; disk florets 12-50, dull yellow. Fruits: Achenes, stout, hairy, black, tipped with 8-20 scales, each scale divided at apex into 5-10 bristles, enclosing small seed. Habitat: Open, disturbed areas, waste ground, fields, pastures, farmyards, and roadsides, most abundant in rocky soils. Uses: Plains Indians gave the plant to horses to treat coughs and would induce nosebleeds by using the powdered leaves as snuff, believing this would relieve headaches. The Navajo used the chewed leaves to treat ant bites and pioneers used the leaves to make a tea to settle the stomach. Comments: A weedy species that has a disagreeable odor when crushed. The oils and resins in the plant can irritate nose membranes, so livestock avoid it. 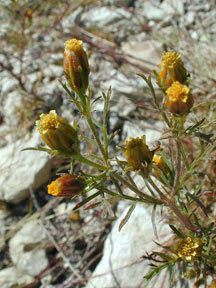 Fetid marigold often grows in prairie dog towns.